If you've only ever seen the movie version of Steel Magnolias, you might be surprised when you see the play on which it was based. Unlike the movie, the entire play takes place in Truvy's beauty salon (where the motto is, "there is no such thing as natural beauty"), and the only characters we see are the six strong, funny, loving Southern women who inspired the title. Husbands, boyfriends, children, and dogs are talked but about never seen, so that the focus of the story is the women and their undying friendship. Lyric Arts' production features six wonderful actors who bring these women to life, directed by a #TCTheater actor who can break my heart and crack me up at the same time, Angela Timberman. She and her cast bring that beautiful "laughter through tears is my favorite emotion" feeling to every moment of this story. So head up to Anoka through June 24, grab some popcorn, and have a good laugh and a good cathartic cry (it was a two-tissue play for me). Lyric Arts has assembled a wonderful cast of women, with some welcome diversity. Juliette Aaslestad is a bright light as Shelby, such a source of life and joy. Anni Amberg is strong as her mother; a bit young for the role but otherwise wholly believable in the range of emotions M'Lynn goes through. Jane Hammill-Golembeck and Kathleen Hardy are a hoot as the always bickering Ouiser and Clairee; Lisa Vogel is a stabilizing force as Truvy, who holds them all together; and last but not least, Sulia Rose Altenberg creates a specific and delightfully quirky Annelle. The reason that this play is so successful and strikes such a deep chord with audiences is that it's true, or at least inspired by truth. 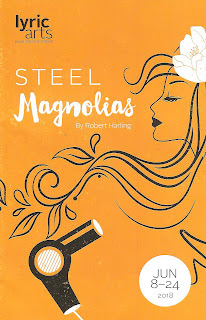 Playwright Robert Harling wrote the play to honor his sister Susan, who suffered a similar fate as Shelby, and the "steel magnolia" women he grew up with, including his mother. For some reason we don't get to see a lot of stories of female friendships on stage or screen, so it's a rare pleasure when we do. Steel Magnolias continues through June 24 at Lyric Arts in Anoka.